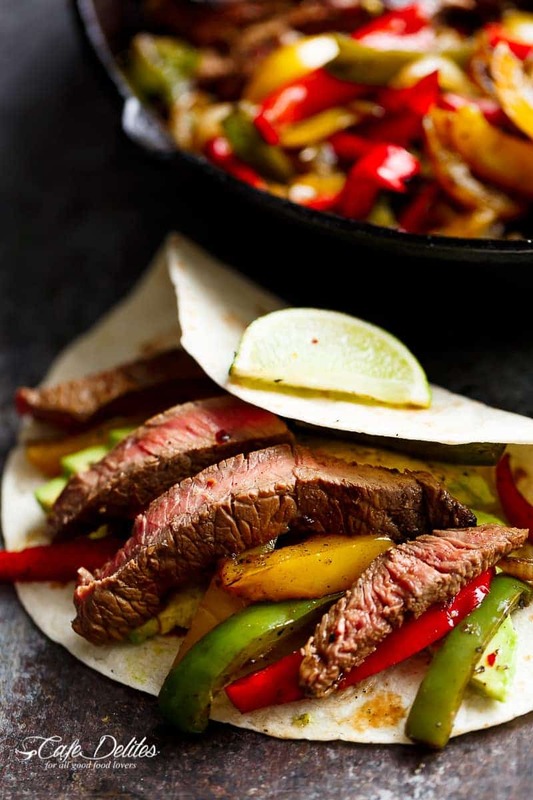 WATCH HOW TO MAKE STEAK FAJITAS RIGHT HERE! *Don't have time to marinade? Don't worry! 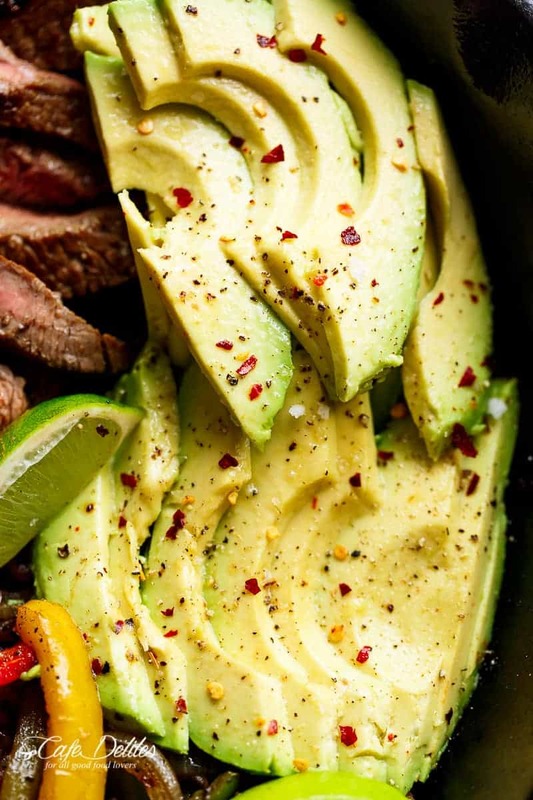 The marinade has so much flavour in it already, you can let it sit for 5-10 minutes at room temperature while preparing all of your other ingredients! 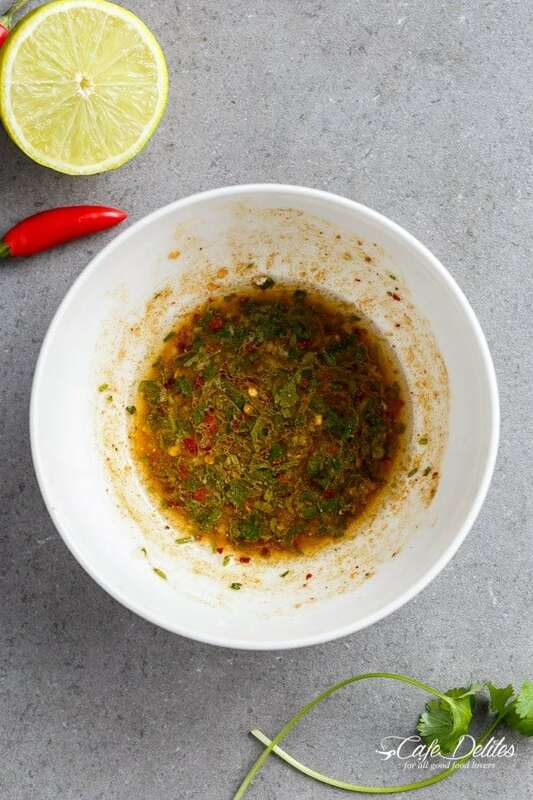 This recipe for chili lime fajitas is fantastic. Your ingredients blend into the most flavorful fajitas I’ve ever had. I followed the recipe exactly and got rave reviews! Thanks so much, this is definetely a keeper. 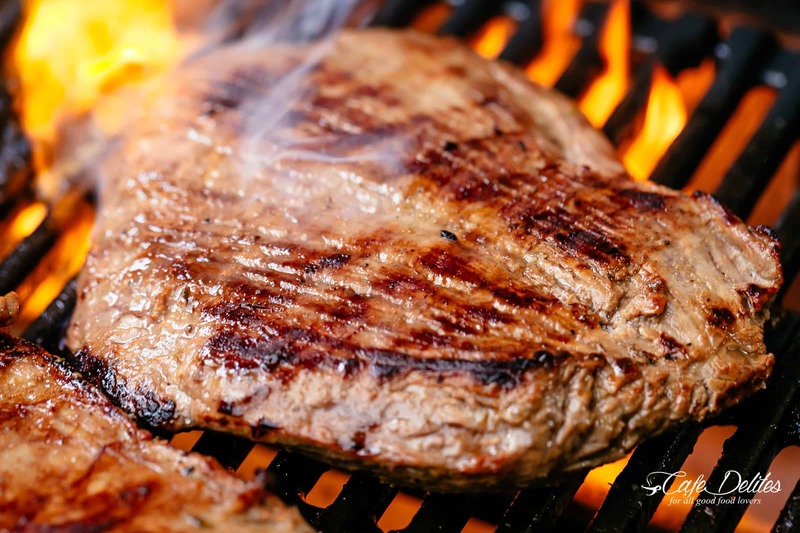 Can you use London Broil steak ? Do the nutrition fact include tortillas or is it just for the steak/veggie combo? Thanks! They were great! Hi Karina. I know I emailed you earlier about someone stealing this from you but I thought to message you here! I don’t know if it’s of your concern but please email me so I can send you the information I have. Thank you so much for letting me know! I will look through my emails and reply back. I apologize for the delay. Thank you for looking out for me! The marinade is to die for! 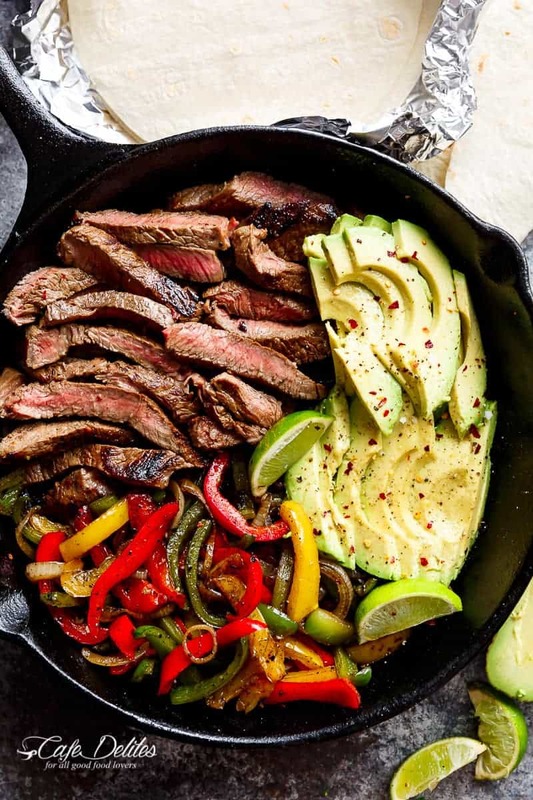 I’ve been making this fajita recipe almost every week for a couple of months. I double the marinade so I have plenty to put on the frying veggies. We sometimes have veggies left over, and we could lick the plate! Thanks for a great recipe! My husband and I really enjoyed this so much! The only issue we had was that I got the wrong cut of beef and it was totally tough. Besides user error, it was amazing! Thank you! What kind of steak and how much? I like to use flank steak, rump or skirt steak. I usually use about 1 pound. Hope that helps! Enjoy your fajitas! 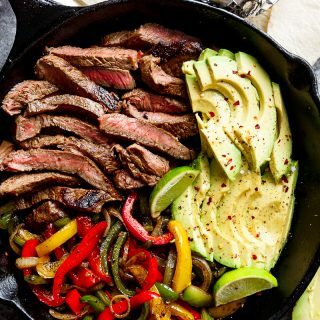 I second another person’s opinion that these are not only the best fajitas I’ve ever made, they are the best fajitas I have ever tasted ANYWHERE! Tomorrow is Cinco de Mayo, so this is a great excuse to make them yet again (like I really need an excuse!). Truly, thank you from the bottom of my heart for this recipe – I love it SO much! Tried it loved it! Only thing I added was an avocado sauce. Thank you for sharing this delicious recipe! My husband and I loved it! Definitely making this for family dinner night! YAY!! I am so glad you both liked it! Thanks so much for sharing! Best fajitas I have ever had ANYWHERE, including top Mexican restaurants! So happy to have found this recipe, thank you so much. WOW thank you Debbie! I’m so happy to hear that! Great recipe! Also, I wanted to add that there is a third way of spelling chili; here in New Mexico, it’s normally spelled in Spanish as chile. Thanks for the recipe! I’m not a math whiz, but I think this is pretty close. Hope it helps. does anyone know the nutrition facts on this receipe? What kind of steak do you use? Just regular sirloin? They look amazing so I was going to use the type of meat that you do! Thanks for this wonderful recipe! My family love this dish so much that I cooked again the next day and used chicken thigh instead. It was so juicy and delicious! Thanks again for sharing this great recipe. Love it. Yum! Made this recently and it was delicious! Probably be added on our meal rotations. Love your recipes so far! LOVED the orange honey salmon!! Your recipes are delicious!! I love your recipes and I believe they will turn me in to a better cook, please keep sending them. They never disappoint, you’re the best and thanks for sharing your talent and skills.